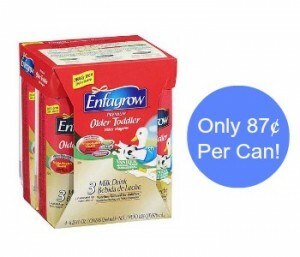 Home > Printable Coupons > Enfagrow Coupon | 87¢ Per Can at Walmart! Enfagrow Coupon | 87¢ Per Can at Walmart! If you have a little one, there is a high value Enfagrow coupon you don’t want to miss! It makes for a good deal at Walmart on toddler ready to drink cans, just 87¢ per can! Makes it $3.48 or just 87¢ per can!